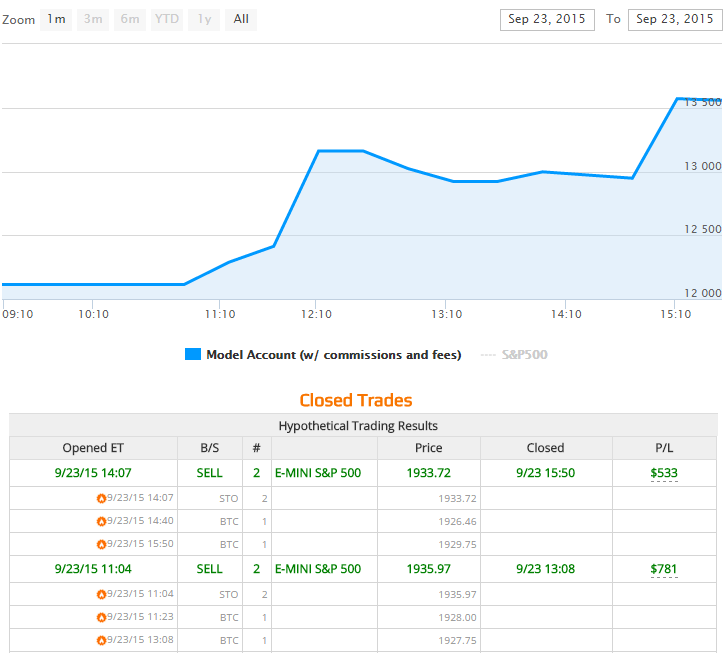 Automated Trading Strategies Results - Low Vol Is Back! Awesome Results – Low Vol Trading Is Back! As you know from recent updates about our automated trading strategies and trading we have been suffering from extreme volatility levels making it difficult for our systems to profit from the market. Through this experience of extremely high volatility (2008 crisis levels) we have been able to identify marketing conditions similar to this and have the trading systems automatically stop trading until more favorable conditions are presented. On Monday and Tuesday we saw the trading robots turn off and avoid the market. Why? Because intraday volatility, price gaps, and price action was unfavorable. We believe in trading only when the market is most likely to generate profitable results. Taking no trades is far better than taking losing trades, which we are sure you will agree with. Today around 11am ET the SP500 index dropped into normal trading conditions and the AlgoTrades automated trading strategies identified opportunities. These normal conditions which we have seen many times in the past has generated positive returns on average. I should mention that the market is very close to a level which the systems will turn off and wait for normal conditions again. One big moving day or a price gap will trigger this. It’s not a bad thing, I just want you to know we will have times (days and weeks) when the trading systems simply won’t trade. Take a look at the image below with today’s trades and results. We could have not asked for a better day. Both trades were timed perfectly for entries and exits. We hope this message helps you to understand the market, our systems and trading activity better. We will continue to keep you informed as to the actions of our advanced trading systems and help you to understand what it is doing.